From a grocery store owner to a fashion designer, everyone believes that the internet has the potential through which they can increase their market value. To stay ahead of the competitors' businesses need to know that getting a website built would not do enough for their businesses. It takes a lot of efforts to increase the presence on the internet and the best way to do is increase presence on different social media platforms and get a mobile application built from a good software development company. Mobile applications are easier to operate and users feel comfortable with the interface. Today, approximately 2.5 million people across the globe are making use of smartphones. It becomes difficult for a mobile app development company to develop an application for different mobile platforms. Lately, there has been ‘n’ number of languages built for creating a user-friendly application and one of them is HTML. HTML5 not only helps in building dynamic web content but also helps in creating an attractive web application. 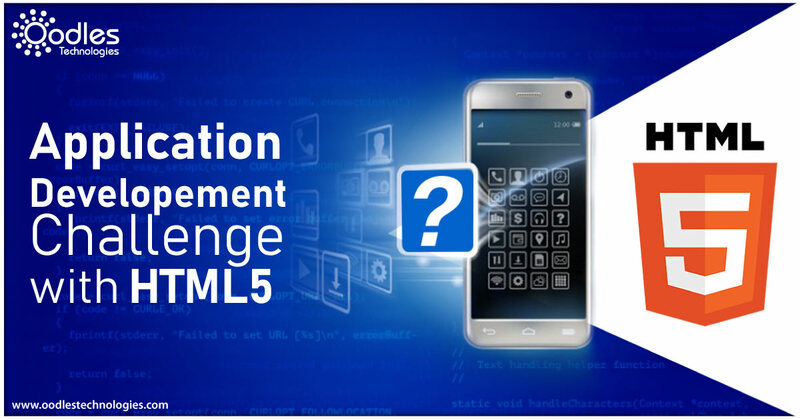 HTML5 mobile applications are powerful, therefore it is challenging for the application developers to use it. Let’s look at some of the challenges that App Development Companies might face while developing HTML5 applications. Developers can minify or obfuscate the code so that it becomes difficult for the users to understand the language and encode what the code really is. Obfuscation is time-consuming for developers, therefore, they feel reluctant to use, But once used along with HTML5 applications can prevent it from unauthorized use. Various HTML5 developers today are facing fragmentation issues while developing a mobile application. At the time of optimizing web applications, software developers use webview element to get connected with OS version of a smartphone. Since different smartphone users are using different OS versions, it becomes difficult for them to fully access that HTML application. This issue is resolvable from the user end since all they need to do is update OS regularly for the webview and avail access to new feature and updates. HTML5 has proved to be exceptionally beneficial for app developers and users with the kind of interface it offers. But sometimes HTML application does not have this ability to give the users access to features like camera, NFC, and more. In such cases, it becomes difficult for a developer to deliver a similar experience as that of a native app. Since HTML5 supports different video and audio formats, it becomes necessary for the developers to include audio/video files in different formats. Different audio formats would increase the pressure on the developers as he would have to create multiple versions of the same video so that the application can run smoother on a range of mobile devices. There are various application Development Companies coming up with HTML5 solutions. If you think that HTML is the best fit for your company’s application development then go ahead. We are a leading HTML 5 App Development Company providing the best application development solutions. In case of queries feel free to contact us now!